Seiken Densetsu series is divided into 5 episodes: Final Fantasy Adventure (Mystic Quest) on Game Boy, Secret of Mana, Seiken Densetsu 3 on SNES, Legend of Mana on PlayStation and Shinyaku Seiken Densetsu on Game Boy Advance. To download ROMS of the second and the third episodes, go to SNES ROMS section. If you want the first episode, go to the Game Boy ROMS page. Final Fanatsy Adventure (US) - Mystic Quest (F) - Seiken Densetsu (J) (1991) is the first episode. In Japon, it's known as SEIKEN DENSETSU. In the USA, it's called Final Fantasy Adventure. 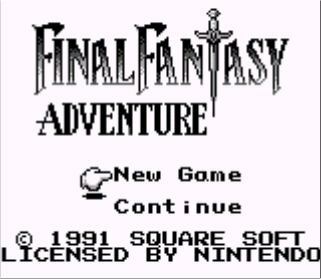 Edited on Game Boy in 1991, this game is a shows an important evolution of the Game Boy because it's its first RPG. 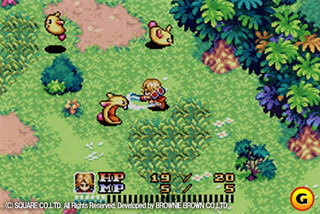 In 2003, SQUARE edit a new game based on the first episodes of the Seiken Densetsu series in Seiken Densetsu: The New Testament or in Japan Shinyaku Seiken Densetsu! A great hit for the Game Boy Advance! Mystic Quest Legend is a very easy RPG (Role Play Game).If you never played a RPG, you should start with this one. In this episode, we discover the Mana Tree which is very important because it grants the balance between good and evil. That's why it could have been considered as the frist episode of this wonderful series. The second episode is SECRET OF MANA (see picture) or SEIKEN DENSETSU 2 released in 1993 in Japan and in the USA and in 1994 in Europe. Look at how much these pictures are nice! SECRET OF MANA was the best selled game in Japan in 1993. But what makes this game fantastic? I discover it in dicember 1994. At that time, I was very young, and as the other kids of my age who go to the supermarket with mommy, I watched the new games for Super Ninteno (yes, the Super Nintendo once was the best video game system and we weren't invaded by Pokemon). All around me people were shouting, bumping into me with their silly cart but there was a soft and pleasant music which attracted me. I like was hypnotized by this music. My eyes turned then to one of the television screens being used for the demonstration ...... As Bernadette Soubirou (famous Bernadette of Lourdes), I had just had my revelation. I missed nothing any more but one thing: the name of this game. The title was posted then: SECRET OF MANA. Considering only the music and the image of presentation, I knew already that this game was going to be the best of all. I then caught the game put in mommy's cart. That's all folks for the story. What makes the quality of this game is the music, very important point. Then, graphics ae wonderful. Playability is excellent. This game is perfect! SEIKEN DENSETSU 3 (1995): excellent game on the witch we find again the same quality as before. We only saw it in Japan and on SecretofMana.fr.fm in English. That's a very good but different sequel. At the begining, you have to create a 3 people group and the you have a different begining and a different end, according to the characters you chose. I'm sure you'll love this game! LEGEND OF MANA is the last episode and the most different. We saw it in 1999 in Japan and in 2000 in the USA. You make your own story. A new style for this wonderful PlayStation game that allies PlayStation's power and SQUARESOFT talent. This game is a total revolution and you hae to own it!